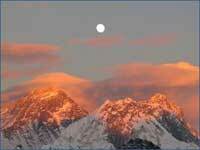 The Mount Everest region is the second most popular trek than Annapurna region in the country. Everest region would have been the most popular destination, had the access of reaching were easier like Annapurna region. The famous Sherpas homeland is a paradise for the mountain lovers as it boast four of the world’s forteen 8000 meters peaks Everest, Lhotse, Lhotse Shar & Cho-You and also host plenty of 7000 m peaks. This trek also offers fine and spectacular trail to the heart of Khumbu valley and witnessing lots of gompas and chortens during the trail. Service includes: airport transfer in a private car, 4 nights in Kathmandu hotel (tourist class) in BB basis, 17 days trek in lodge basis, 3 meal & accommodation in the available lodges during the trek, national park fees, flight fare Ktm-Lukla-Ktm, one guide, one porter for 2 member, daily wages and meal and accommodation of guide and porter, one porter is allowed to carry maximum of 30 kg of total weight, insurance of guide & porter, full day sightseeing with English speaking guide with all entrance fees one fare, well dinner in Ktm. Day 03 Kathmandu - Lukla (2850m) - Phakding (2600m): In the morning we take the flight from Kathmandu for Lukla, about 50 minutes with the wonderful views of the Himalaya (on a clear day). After arrival at Lukla there will be sometime taken by the guides to arrange all the porters and necessary requirement. 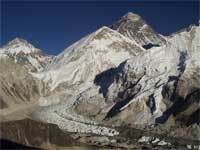 After Organizing with porters and Sherpas the trek starts immediately to Phakding (2600m). Short stage (3h) and down. 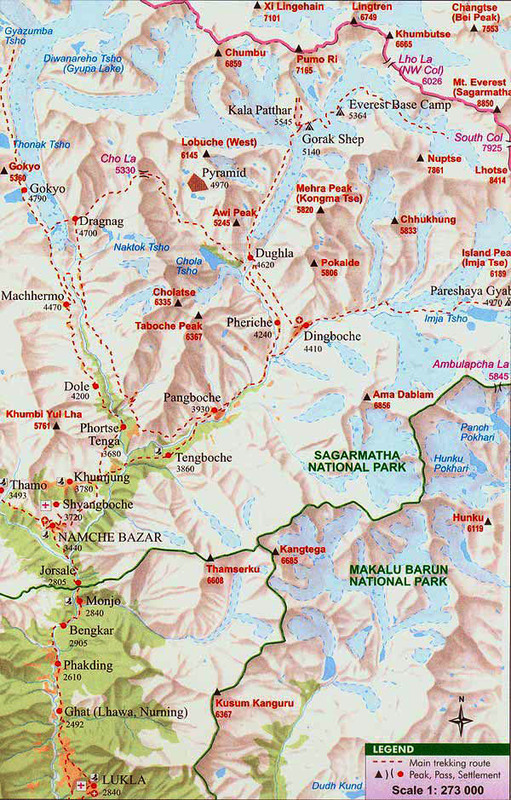 The short walk will stop at Phakding for the day. Day 04	Phakding - Namche Bazar (3440m): We follow the Dudh Koshi River, right and left side alternately. The track cut through the rocks, edged with crops suddenly goes up till Namche Bazar, capital of the Sherpa area: several small shops, Tibetan souvenirs, market on Saturday. As Namche being the hub for every trek in Everest region, it offers plenty of Lodges around. We choose one and stop for the night. 6 hours walk. Day 05	Rest day at Namche: Today we can explore around Namche by going to Thamo Village and its near by places. This will be good to know the lifestyle of dwellers around there and also good to get acclimatized for the upcoming high altitude trail ahead. We stop at Namche today for the night too. Day 06	Namche Bazar - Kumjung (3790m): Visit of the Everest National Park’ Museum (first viewpoints of Khumjung village. Wonderful view of the prince of the place: the Ama Dablam (that means: the mother who rises). In the afternoon, visit of the Kunde experimental “hospital”. 3 hours walk. Day 07	Khumjung- Dole (4040m): Dole means “many stones”, but, despite this it has pleasant kharka on the trail. This morning walking on the hillside where it will be possible to surprise the “goral” in the rocks covered with edelweiss. Then we branch off into the Gokyo trail. valley while going up into a rhododendrons forest embellished with nice waterfalls. We stop at Dole for the night, small high mountain pasture village. 4.30 hours of walk. If necessary, this day can also be used as an acclimatization day. The following days being quite short indeed. Day 08	Dole - Machermo (4440m): The trail passes from one village to another, after an hour walk, we come to Luza (4360m.) and we progressively discover new mountains, especially Cho Oyu (8143m) making border with Tibet. Over night in lodge at Machermo. 3 hours’ walk. To avoid high altitude risk short walk is precautious. Day 09	Machermo - Gokyo (4750m): Our destiny today is to reach up to Gokyo lakes then we will understand that Cho Oyo means “Turquoise lake”. We cross Pangka (4480 m), a kharka. There are some more magnificent views and then the path leads to where the high mountain of Ngozumpa glacier meets rock walls. Follow the rock wall trail, cross the wooden bridge over a stream that comes from first pond. This first pond is too small to be called first lake (Longponga). Then second lake (Taujung) on seen appears. Later 3rd lake on our trail and stop for the night at Gokyo, center of mountains cirque which is considered by some as aesthetically better spot than Everest’s view from Kalapatthar. 4 hours walk. Day 10	Gokyo Peak (5280m): Easy way on the south hillside so slowly our acclimatization is going well. It’s about 5 hours walk in total. The view from Gokyo Ri is only one of the many reasons for visiting Gokyo. Relaxing on the lodge, picturesque lake is worth seeing, and for many more. Day 11	Gokyo - Nyimagawa (5050m): Today we start our walk to the bottom of ChoLa pass (5420 m) and that is why we have to take only what we need, rest are carried by the porters to make our luggage lighter. We cross the ending tongue of Ngozumpa glacier. Snack at Dragnag before going up again for settling at the Cho La pass foot. A 5 hours walk. Day 12	Nyimagawa - Cho La (5420m) - Dzongla (4840m): It’s a straight ascend walk about 2 hours up where the trail leads to the pass. After crossing the pass a new valley appears in front of us as a reward which erases all those exhausting climb in a snap of time. The trail then gently goes down with a short glacier crossing without danger and we reach Dzongla, where we stay for the night in a simple lodge. 5 hours walk. Day 13	Dzongla - Lobuche (4930m): Short hillside walk with so many tremendous views of mountains like Jobo Lhaptshan north face, Nuptse, Pumori, Everest, Lhotse, Ama Dablam is for the day. .. Simple lodge at Lobuche village. 3 hours walk. Day 15	Gorak Shep - Everest Base Camp (5400m) - Lobuche. : During the climbing season you can see frequently Yak & Sherpas of the expeditions group going upward. During winter sometime trail becomes difficult to locate unless there a trail through the snow. Walk on a moraine pieces covered glacier and stop at Ice Fall foot! Back on the same way till Lobuche 7hours . Day 17	Dingpoche - Pangpoche (4240m) - Tengpoche (3860m): Again the trail goes gently and easy down facing Ama Dablam. Lunch in front of Pangpoche monastery is advisable. After crossing the torrent on a suspension bridge the walk about 2 hours is very pleasant and easy through the forest well kept by Thyan-boche (“Heelprint mountain”) monastery’s monks. Our lodge will be at Tegnboche where one can visit nice monasteries around. Especially one, the monastery which has was destroyed by fire in 1989 now rebuilt. 5 hours walk. Day 18	Tengpoche - Phunki (3250m) - Namche Bazar (3440m): Fast way down through a nice forest. Suspension bridge at Phunki before a slow way up, then a balcony path leading to Namche Bazar where we settle at Namche or again descends down for hardly couple of hours to Monjo. 6 hours walk. Day 19 Namche Bazar - Phakding – Retreat back the same trail which we have started in the beginning. 7h day. Day 20	Lukla - Kathmandu flight: flight back to Kathmandu Transfer to hotel and free afternoon. Day 21	Evening farewell dinner is arranged. Hotel.